Going into the premiere episode of True Detective season two, we knew the answers to almost all of the show’s most basic, production-based mysteries: who’d star, who’d direct, and where the season would be set. But there was still one crucial piece of the puzzle missing: Who would sing the theme song? As we learned tonight, the answer to that question turned out to be pretty awesome: none other than Leonard Cohen. Yep, that sparse, gravelly, and altogether badass song you heard over the opening credits was “Nevermind,” a track off Cohen’s most recent studio album, 2014’s Popular Problems. As we know from last season, when music supervisor T Bone Burnett chose the Handsome Family’s dark, slinky “Far From Any Road” as the theme song, True Detective is the kind of show that puts a lot of stock in its opening credits — they set the show’s all-important tone. Judging from last night’s episode, the mood of season two is even bleaker than its nihilistic-but-campy predecessor, and “Nevermind” — a laconic, husky-throated dirge that hangs over the opening credits like a heavy fog — was our first indication of that fact. Cohen’s low, weathered voice booms like an Old Testament God played by John Wayne. On the surface, “Nevermind” sounds terribly bleak, echoing the show’s flirtations with nihilism and theories about the meaningless of existence: “There’s truth that lives/ And truth that dies/ I don’t know which/ So nevermind.” (It is the sort of song I can imagine Matthew McConaughey listening to on repeat in his Lincoln.) The song has been condensed for the credits, but on the album it’s more apparent that it is about the aftermath of a war, most likely in the Middle East. (In the longer version, kirtan singer Donna DeLory repeatedly sings the word salaam in the background.) 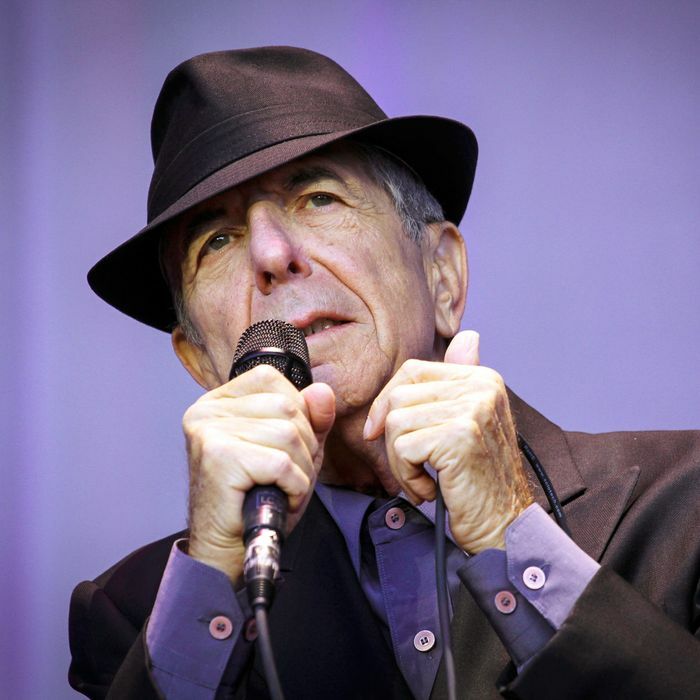 Their contrasting vocal stylings, and languages, echo the duality that Cohen contemplates in the lyrics. But taken in the context of Cohen’s life and career, the song is more complex than a brooding, noir-ish downer. Book of Longing was, notably, the first work that Cohen published after becoming an ordained Rinzai Zen Buddhist monk; he spent five years in the mid to late ’90s living in seclusion in a monastery outside of L.A. Considered with Cohen’s Zen practice in mind, the refrain of nevermind starts to feel less like a declaration of Rust Cohle–esque nihilism and more like an embrace of Buddhist non-attachment and the surrender of the self: “I had to leave/ My life behind/ I had a name/ But nevermind.” In the monastery, Cohen took the name “Jikan,” which roughly translates to “silent one” — a particularly ironic moniker for someone who, in the outside world, had made his name as a famous singer. This is, of course, not the first time one of Cohen’s songs has played a prominent role on a soundtrack. In 1971, Robert Altman used three of the songs off Songs of Leonard Cohen to unforgettably haunting effect in McCabe & Mrs. Miller, layering them almost like ambient sounds that floated in and out of the film’s atmosphere. Then — following the success of his masterful synth-driven comeback album, 1988’s I’m Your Man — the ’90s saw a whole new generation embrace Cohen through his placement on soundtracks: A few I’m Your Man songs appeared in the Christian Slater flick Pump Up the Volume, and more famously, songs from his 1992 album The Future were used in Natural Born Killers. Cohen’s no stranger to TV either: You can go to Hulu right now and watch Cohen’s 1984 guest appearance on (yep, really) Miami Vice. In a way, “slow” has been the default speed for Cohen’s entire career. It took decades (and countless covers) for his song “Hallelujah” to become the beloved anthem it is today, and his hugely successful 2008 world tour was something of a long-delayed victory lap. (His 2012 album, the cheekily titled Old Ideas, was also his highest-charting album to date.) Hopefully, the True Detective bump will expose a whole new generation to Cohen’s music and continue his late-career renaissance. And hey, maybe the show’s producers can even hook him up with the designers who do those evocative credit-sequence visuals. As the cover of his most recent live album demonstrates, he’s in pretty dire need of a new Photoshop guy.